I went with a friend today and found that the Immigration Department was open at 6:30 a.m. (maybe earlier) and that you can get the e-Gate Pass at the same time your apply for it. The guide below should still be accurate, but please read through the comments to see what other people are seeing when they go. I've received a few comments recently from people who followed my guide and wanted to update it with their experience. Lori said she started the process at 6:30 a.m. and was able to pick up the card at that same visit. John, on the other hand, said that eye tests and fingerprints happen in the morning (6 a.m. to 1 p.m.) and that cards can be picked up in the afternoon (4 p.m. to 7 p.m.). This has never been my experience, but things change day to day, so just try to go at 6:30 a.m. and then hope for the best. This morning I went to the Gharafa Immigration Department to get our e-Gate passes, which will allow me to skip the normal immigration lines at the airport when leaving or returning to Qatar. It took a little bit of asking around to figure out how to do this, so I thought I'd write up a little guide. Gather your Qatar ID card, your passport, and a credit or debit card (I also brought along cash, just in case). Wear clothes that cover your knees and shoulders (this is true for visiting any government office in Qatar). You may not be let in with a bag or a briefcase, but I'd recommend bringing a book or Kindle in case you have to wait for a while. Go to the Gharafa Immigration Department off of the Doha Expressway near Education City. If you need help finding it, just look at the map above. Alternatively, click this link and type in your starting location and Google will give you directions. According to Google, it's open from 6 a.m. to 1 p.m. and from 3 p.m. to 7 p.m., Sunday through Thursday. I went on a Tuesday morning around 7 a.m. and didn't have any problems, but a friend went a few weeks ago and found them closing around 4 p.m. Just to be safe, I'd try to go in the morning. Park on the street outside or, if you can, in the parking lot on the west side of the building. Look for Door 2 (pictured above) in the middle of the building. It has a sign above it which reads: Expatriate Affairs Department. Enter here. Once you're inside Door 2, walk straight forward until you see a small cubicle to your right with a man and a digital kiosk. There might a line, in which case, wait your turn. A man will be standing at the kiosk to help you. He'll take your Qatar ID card and then use the kiosk to scan your eyes and fingerprints, take your picture, and record your signature. Once you're finished he'll give you back your Qatar ID card and point you toward a counter where you'll take a number to wait your turn for to pay. The person who you paid will ask you to sit down for a few minutes while they make you a new, e-Gate enabled Qatar ID card with a chip in it. They'll call your name when they're ready for you. Once you have your chipped Qatar ID card back, take it to one of the two digital kiosks to the left of the door you came in. There should be someone standing at each of them. Hand one of them your Qatar ID card and they'll use the kiosk to activate it. 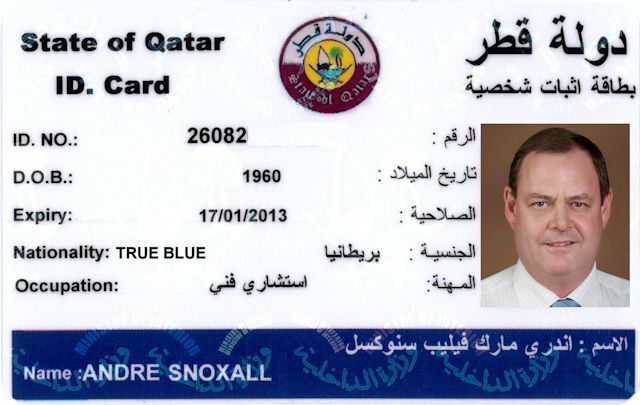 It probably took me about thirty minutes from when I walked in the door to when I left with my new Qatar ID card. And that's it! Now that you have your e-Gate enabled Qatar ID card you'll be able to pass through immigration at Hamad International Airport without waiting in the long line or stamping your passport.